The Tanoshiboy Chronicles: Design & Illustration Blog: The Ragin' Cajun! 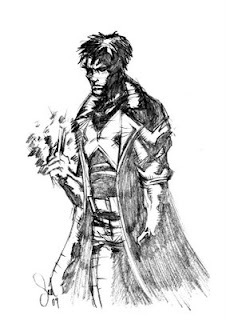 I felt like drawing one of my favorite X-men, Gambit. I did my own take on his costume, but with the trench coat intact. I used a 6B pencil to really get that dark shadowy look. Most people would draw him flinging the charged-up cards but I wanted to capture that "wind-up" moment. The moment where he looks like a bad@$$.